Iron Man 3 is poised to be one of the biggest movies of this year, if not the biggest. They decided to use a different director this time, Shane Black of Lethal Weapon fame. Robert Downey Jr. picked him because he helped restart Downey’s career by casting him in Kiss Kiss Bang Bang. This movie does a pretty good job as a follow up to The Avengers, but it just doesn’t go as deep into Tony’s character as I would like. The movie starts off with Tony (Robert Downey Jr.) retelling some events that happened in 1999, pretty much he was a jerk to Aldrich Killian (Guy Pearce) by blowing off a business proposal, and then he uses scientist Maya Hansen (Rebecca Hall) as a one night stand, and says that he created his own demons. It then fast forwards to current day and a terrorist called The Mandarin (Ben Kingsley) is blowing up places all over the world and the US saying that he is trying to teaching the US a lesson. When Happy (Jon Favreau) gets hurt then Tony Stark takes in on himself to end The Mandarin threat. This movie promised that it was going to get deeper into Tony’s mind and explore his self destructive ways, and they kind of do by having him not be able to get over his PSD from after The Avengers events, but because they are trying to make an action movie, and a kid friendly one at that, they don’t get in to his alcoholism or his drug use. They just gloss over everything, and it makes it more of a distraction instead of a plus. We do get to see that his has made much deeper bonds with Pepper Potts ( Gwyneth Paltrow) and Happy, so that is good. As far as the action and special effects go, they are all top notch. Showing that the people over at Marvel still know how to make an action movie. Downey is Tony Stark, so I am not sure what they are going to do when he decides he is too old to wear the suit, because without his wry wit, and perfectly jerky attitude I am not sure we would like Tony so much. Despite my problems with story I still liked this movie. The action is good, and Downey is just fun to watch at this point. It is just a shame that Disney decided that they didn’t want to make the movie that Marvel promised. Sword and Chant is a fantasy novel by Blair MacGregor. It is the second novel I have read out of my indie novel bundle, so I paid a little less than a dollar for it. Was it worth it at this lower price? Yes, but it was not my favorite book. 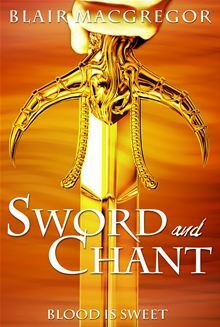 The book is about a young girl Shala who was raised as Kennem that finds out she is in the line of the Swords. The Swords’ job is to hold off the banished Calligar god The Chant. The land is on the brink of war between Calligar and Kennem because The Chant’s people The Exiles hide among the Kennem, and the Calligar want to root them out. This obviously causes conflict because she now has to side with Calligar, but she mistrusts them. The author did a wonderful job creating the land, the gods, and the magic system for this book. It seems like a place that actually exists and that is wonderful, but it is also a book where nothing fun happens, and no one is happy is except for The Chant when people die. It is just depressing, so it was hard to get through. It may have just been that I was in the wrong mood to read this book, but for me I always like it when at least someone smiles, sometimes. When there is nothing but gloom then books start to drag for me. If you are looking for an incredibly detailed world to visit then this is a decent book to try, but for me it was just too depressing to completely enjoy, but it is good to see an indie author writing her books, and getting them out there and in to a lot of hands, and I wish her the best. 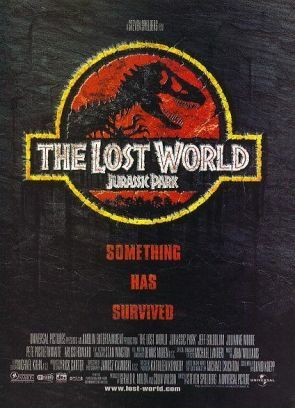 Having recently watched the rerelease of Jurassic Park on the IMAX, my wife and I have decided to watch its sequels as well. 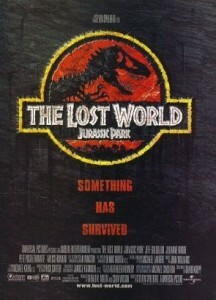 The Lost World: Jurassic Park came out in 1997 and was directed by Stephen Spielberg. It is not as good as its predecessor, but is still a lot of fun. The movie starts with Ian Malcolm (Jeff Goldblum) being brought to John Hammond’s (Richard Attenborough) house to discuss something, and it turns out Hammond wants Malcolm to go to another island he owns that he cloned the dinosaurs on and help a team document them. I am never quite sure why he wants a theoretical mathematician to document the dinos, but oh well someone we know has to go, but he can only be convinced to go once he knows his girlfriend Sarah Harding (Julianne Moore) is there already, so he goes to recue her, but then his daughter who wants some time with her dad sneaks on the boat and goes too. Things go okay until people show up and try and capture the dinosaurs, and then things go decidedly unokay. The plot is a little contrived, but it works and it is mostly believable. Sadly a lot of the actors are not. They have some good people in this movie, but it seems like they are all just showing up to collect their paychecks. It is a shame too because without the wooden performances this movie could have been a lot better. The special effects in this movie are good, but not as good as they were in the Jurassic Park. They use a lot more computer animation in this movie and it is not for the better. The first movie blended animatronics, puppets, and CG so well that it still holds up. This one the animatronics look worse and so does the CG, and the movie suffers for it. All that being said it is still a fun movie, and watching dinosaurs is always good time which why I will probably watch JP4 when it comes out next year. Star Trek was its own Nemesis! 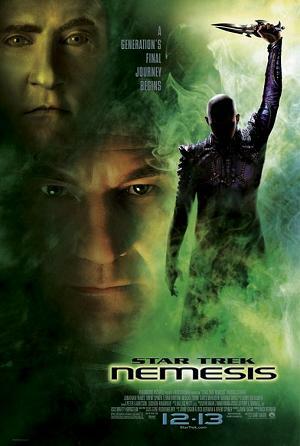 Star Trek: Nemesis came out in 2002 and was directed by Stuart Baird. It was the first Star Trek film to be a total financial failure, so it was the last Star Trek movie to feature the Next Generation cast. This movie tried hard, but it still wasn’t very good. The plot is fairly nonsensical, but it goes something like this: The Enterprise finds one of Data’s brothers, and then Romulans get taken over by their fellow solar system mates the Remans. 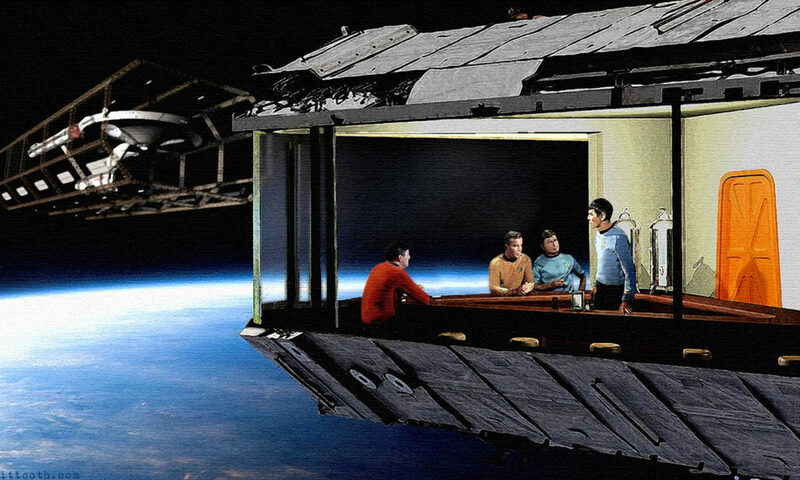 The Remans offer to make peace with the Federation, so they send for a ship and as it turns out the closest ship is the USS Enterprise-E. Also the leader of the Remans is the clone of Captain Picard, and he probably doesn’t want peace after all. There are a lot of problems with this story and it is full of holes, but I will give them that they tried to go deeper in to who Picard is by having him face his clone, and likewise Data by finding his primitive brother. They also tried to make the movie a little more action packed then Insurrection, and I would rather them swing and miss like this than just recycling the show like they did in the previous movie. I just think it could have used a few rewrites. Another one of this movie’s problems is that Baird is not as good of a director as Jonathan Frakes, and I don’t think Insurrection was his fault, so the change did not make sense to me. I don’t really need to talk about the acting at this point because they all just play the characters we know and love exactly like they always have, so if you were hoping for a change then this movie doesn’t have it. This movie is not good, but it is way better than the feeble attempt that Insurrection was, and I think if you are a fan of the show or the movies then it is worth watching, but for casual fans, stay away. I Check out a Couple of the New 52! Thanks to Free Comic Book day getting me in my local comic book store Cosmic Comics on Cornwall Street in Bellingham WA. I decided to give a couple of DC’s New 52 comic books a shot. 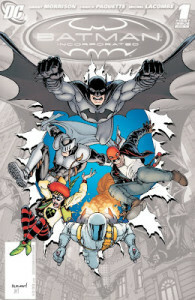 First up I decided to try out Batman Inc. This is of course the comic book that follows Bruce Wayne’s ambition to start Batman franchises in Cities that need a caped crusader in their town, and the issue I read was all about Batman picking out just the right people to join his organization. It is a surprisingly funny comic book. It is drawn well, and it looks like they are picking a good group characters for the story arc. It is defiantly something that I will be reading in the future. Wonder Woman has been praised as getting one of the best reissues of the group, and after reading the first few issues, I can see why. 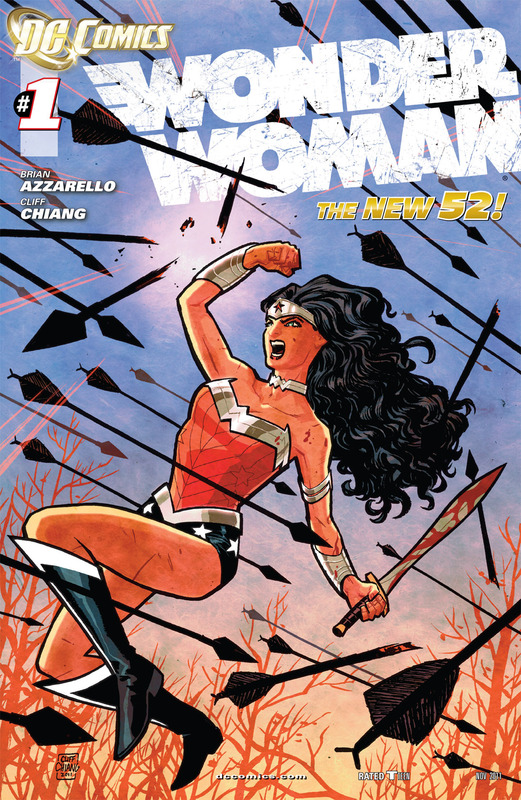 The story is really getting in to who Wonder Woman is: Her identity as the Amazonian Dianna and also as Wonder Woman, and which person is really her. The story follows Wonder Woman as she tries to protect a young girl from the gods because she is pregnant with Zeus’s child, and Dianna learns that she too is a demigod of Zeus’s. It is good to see that DC has decided to take the Princess seriously.